From 20 October 2017 to 25 February 2018, Zeng Fanzhi | Van Gogh will be on display at the Van Gogh Museum. 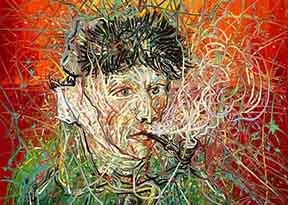 In addition to being one of the best-known contemporary Chinese artists, Zeng Fanzhi (1964) is also a huge admirer of Vincent van Gogh. Especially for the Van Gogh Museum, Zeng created a series of six paintings inspired by Van Gogh’s self-portraits. Three of these portraits will now be displayed in the Van Gogh Museum, together with a painting of Zeng’s shoes and an imposing 2 x 3.5-metre work that was inspired by Van Gogh’s masterpiece Wheatfield with Crows. Zeng’s new work, including this impressive wheatfield, will be officially unveiled on 19 October before being put on public display for the first time. Zeng Fanzhi views Van Gogh’s iconic paintings from a Chinese perspective, adding a personal twist in his own works. In Zeng’s versions, which are alive with winding lines, he links his own style and identity to the life and work of Van Gogh. Through his eyes, the viewer is offered an alternative experience of Van Gogh’s self-portraits, shoes and wheatfields. Zeng Fanzhi helps his audience to see and reflect on Van Gogh’s brushstrokes, use of colour and artistic vision.